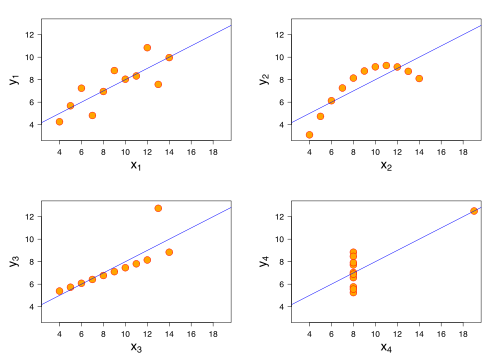 Anscombe’s quartet comprises four datasets that have nearly identical simple statistical properties, yet appear very different when graphed. Each dataset consists of eleven (x,y) points. They were constructed in 1973 by the statistician Francis Anscombe to demonstrate both the importance of graphing data before analysing it and the effect of outliers on statistical properties. The first scatter plot (top left) appears to be a simple linear relationship, corresponding to two variables correlated and following the assumption of normality. The second graph (top right) is not distributed normally; while an obvious relationship between the two variables can be observed, it is not linear, and the Pearson correlation coefficient is not relevant. In the third graph (bottom left), the distribution is linear, but with a different regression line, which is offset by the one outlier which exerts enough influence to alter the regression line and lower the correlation coefficient from 1 to 0.816. Finally, the fourth graph (bottom right) shows another example when one outlier is enough to produce a high correlation coefficient, even though the relationship between the two variables is not linear.